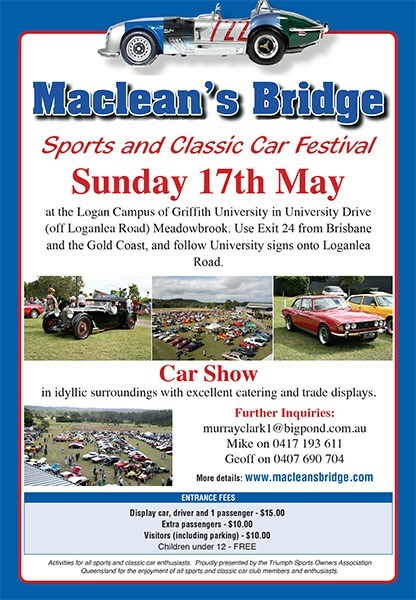 QLD: The Maclean's Bridge Sports and Classic Car Festival will be held on Sunday, 17 May, 2015 at Griffith University, Meadowbrook. 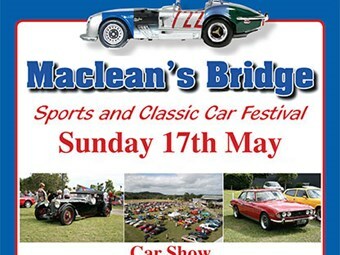 Presented by the Triumph Sports Owners Association Queensland, the Maclean's Bridge Sports & Classic Car Festival will be held in the idyllic surroundings of Griffith University on Sunday, 17 May. Now in it's 40th year - its second at the current location - the Maclean's Bridge is a major sports and classic car festival in Queensland. Over the years, the event has attracted 57 various sports and classic car marques to participate. Catering and trade stands will be available on the day, and trophies will be presented for several display classes, including a people's choice award. Entry for display cars is from 7:30am, public entry from 9:30am, with awards being presented from 12:30pm. Use exit 24 from Brisbane and the Gold Coast and follow the University signs onto Loganlea Road.